I love how Yaya added the word "golden" to make this dish seem that much more appetizing! This is a recipe that she typed up herself and I don't recall calling it "golden" when I used to request this dish. We just called this dish "torta." Like Madonna, you know. Or Cher. Or Bono. As is apparent from the photo above, this recipe is a well-used one. It's popular with everybody! Actually, one could say that this page is a collection of Yaya's greatest hits, having not just this Golden Egg Torta, but recipes for Barbequed Pork (Philippine Pork "BBQ" and its Philippine Chicken "BBQ" variation) and Philippine-style Hamburger as well! We have now blogged about all these three recipes. This torta doesn't need any hype, because by itself, even its simple, unassuming self, it already looks and tastes delicious. It really is amazing to me how such simple ingredients can yield something that is infinitely greater than the sum of its parts. Start with some eggs and ground pork. Be careful not to put too much ground pork, as we, in our ignorance, had done before. There has to be a balance between the ground pork and the egg, that perfect state when they become "porkegg" (or "eggork") instead of pork-plus-egg or egg-plus-pork. Then add soy sauce, sesame sauce, and black pepper. Yaya adds a little bit of cornstarch to bind the whole mixture together. Then, just cook them as you would pancakes. Start cooking on one side, then flip. You can make big torta (like on the left) or little ones (like on the right). The torta smell is quite intoxicating, all sesame-y like that! Check out the porkegg-y/eggork-y interior. 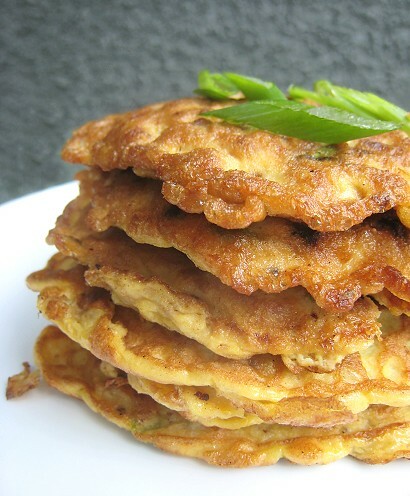 Now, eat torta out of hand by itself or it is quite amazing with rice. Some people prefer it with ketchup, but I prefer the whole thing with either Knorr or Maggi. Although, now that I think of it, why haven't I tried this thing with sinamak (chile-infused vinegar)? Hmm. 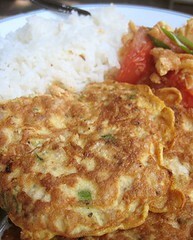 . .
Golden Egg Torta is part of an Eggy Home-style Meal. 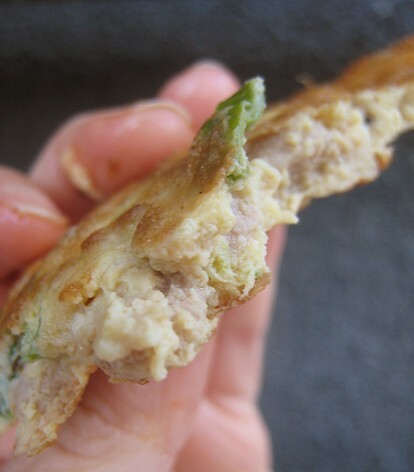 We're submitting Yaya's Golden Egg Torta to Núria's blOg yOur Omelet event. Núria is generously sending over IBERIAN ACORN HAM(!!!!) to the lucky winner of this event. Wow! To learn more about the event and to participate (as you should! 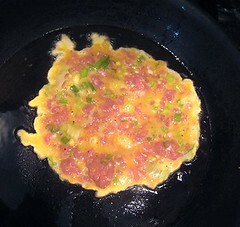 ), please visit http://recipespicbypic.blogspot.com/2009/03/blog-your-omelet-announcing-my-new.html. Scramble the eggs. 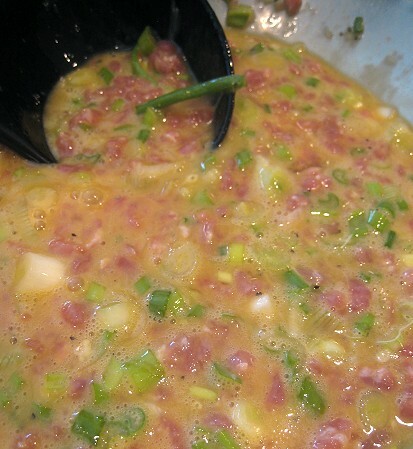 Add all the ingredients into the eggs and mix together. Heat oil in a saute pan over medium heat. 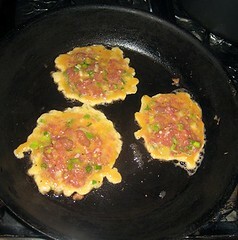 Pour egg mixture into the pan and cook until the bottom half of the torta is cooked. Flip over. The size of the torta is your choice. Make one big one or several small ones. You may want to do a tester torta first, then adjust the seasoning (soy sauce, salt, black pepper, sesame oil) of the mixture according to taste. Cook torta in batches until all the egg mixture is used up. Serve with condiments such as ketchup, sweet chile sauce, etc., if you wish. This looks wonderful! What a wonderful snack...or meal. Plus, it looks so easy. You have great photos on here! These look great, kinda like egg fu yung which I love. I don't know about ketchup though, maybe some kind of sauce. Try pork + cilantro with egg...it's good too! Love these tortas as well. We cook the pork first at my house then dump it in the egg. Yeah, ketchup and rice is needed but the vinegar sounds good as well. YUM! Thanks and good luck with the Ham!!!! This looks like a healthy low carb breakfast! How cute. Thanks for sharing! Hey my Chinese mother makes something very similar! We use either pork or beef, depending what we have leftover. 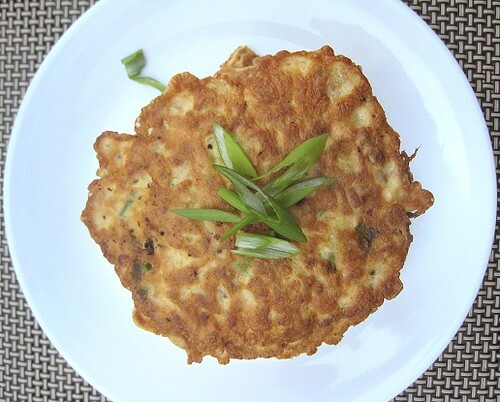 It's delicious with some lovely steamed rice and stir fried veggies... and cold the next day! 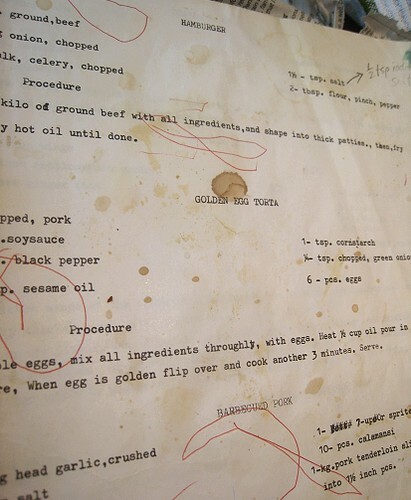 Love the pics of the old recipe! Oooh... we were wondering about how people do their tortas and what the differences would be. Very interesting. Ooh, we love cilantro. Yes, will try a cilantro variation. Oh, it seems your tortas are similar to Manggy's. We were happy to be able to think up of something to enter. 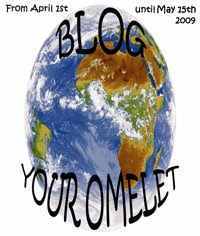 Good thing you have OMELET as the topic because eggs really are fast and easy to prepare! Thanks for visiting! I think everybody has some sort of "dump stuff into eggs" dish. =D Teehee, I don't think of the recipe sheet as old -- but I'm thinking about it, and they are 20 years old. They *are* old!!! This looks good. 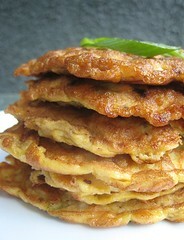 I also do my torta similar to this - goes well with my favorite Banana Ketchup. One time I tried doing torta using ostrich egg that I got when I was still in the Philippines and it was a blast.